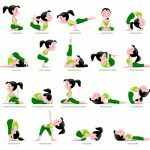 As described in the captions to Figures 2 and 3, yogis hold both Urdhva Dhana and Vrikshasana for unbelievably long amounts of time. Brhadratha is said to have held Urdhva Dhana for one-thousand days and the general prescription is to hold it for 12 years! Figure 1 shows another king, whose name is a bit like Brhadratha. He’s called Bhagiratha, and his myth tells us he did Tree Pose for one thousand years to persuade the gods Brahma and Shiva to bring the Ganges River to Earth. (This was before the Ganges River existed on Earth!). standing in supported Tree Pose for 6 years. Close to Bhagiratha, there is also a cat in Vrikshasana (figure 4). 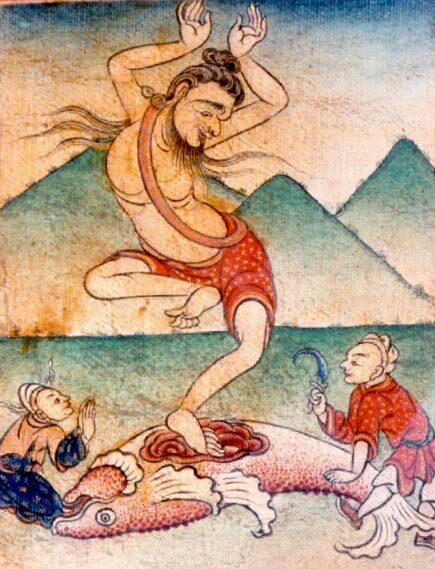 Scholars think he illustrates a well-known Indian fable about a cat pretending to be a peaceful yogi; he fools mice (seen at his feet) before he eats them! 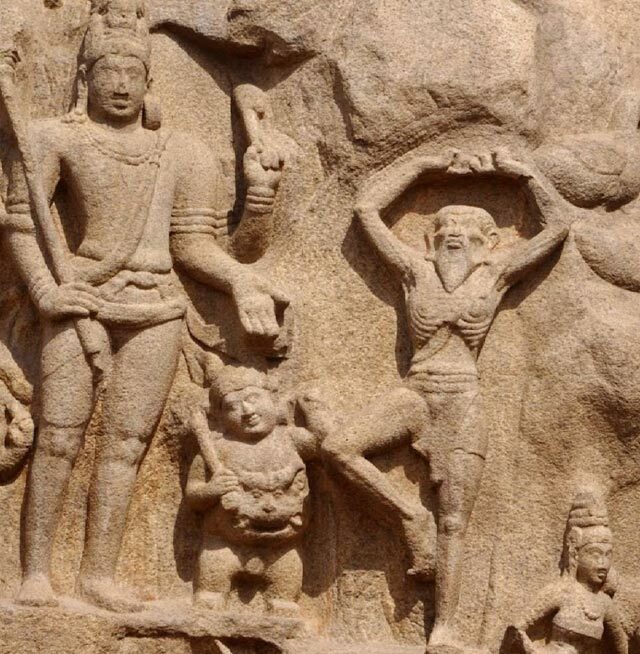 These two scenes are found on a rock wall called “Bhagiratha’s Penance” or “The Descent of the Ganges” and are dated to the 7th century. The monument belongs to the sacred site near Mahabalipuram—a city on India’s Southeast coast, not far from modern-day Chennai. Figure 4. 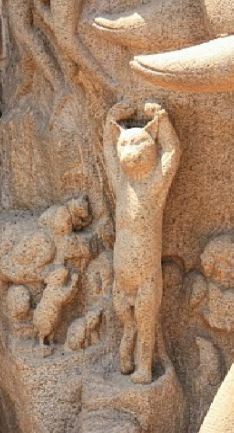 A cat in Tree Pose, also from Mahabalipuram. The pose has probably existed since at least the time of the Buddha (c. 4th to 5th Century, BCE). Legends about Buddha and old texts called Vedas (c. 1200 BCE) describe “tapasic” (psychic heat-building) practices that may have included Tree Pose. In the modern practice of “earthing” practitioners are encouraged to connect to the energy of trees (by hugging them! ), and yogis probably knew this power, for in old pictures and modern practice, yogis commonly take the pose while touching or standing close to trees. The tree’s shade is often the scene of an Enlightenment experience, too, as when Buddha gained satori under the Bodhi Tree. In terms of Hatha Yoga and Kundalini Science (Kundalini Vidya), Tree Pose facilitates ucchara, which is the stimulation of udana vayu — the metabolic tendencies that drive life energy upward in the body. When we hold poise, our prana (life force) goes up, and this is easy to feel in yoga’s balancing poses. Upward-moving prana facilitates the release of a more transformative energy called Kundalini, which also moves upward–from its source at the base of the spine. This is a well-loved pose that appears throughout history. Among standing poses, Warrior Pose, is found on Indian coins as early as 100 BCE, but only Vrikshasana is found in pre-modern texts. We something like Tree Pose in the several of the moves from position to positon called karanas, which belong to the vocabulary of Indian Classical Dance (figure 5). These karanas were first described in the Natya Shastra, a book on India’s artforms composed in the 1st century. Figure 5. Three Karanas from Indian classical dance which approximate Tree Pose. 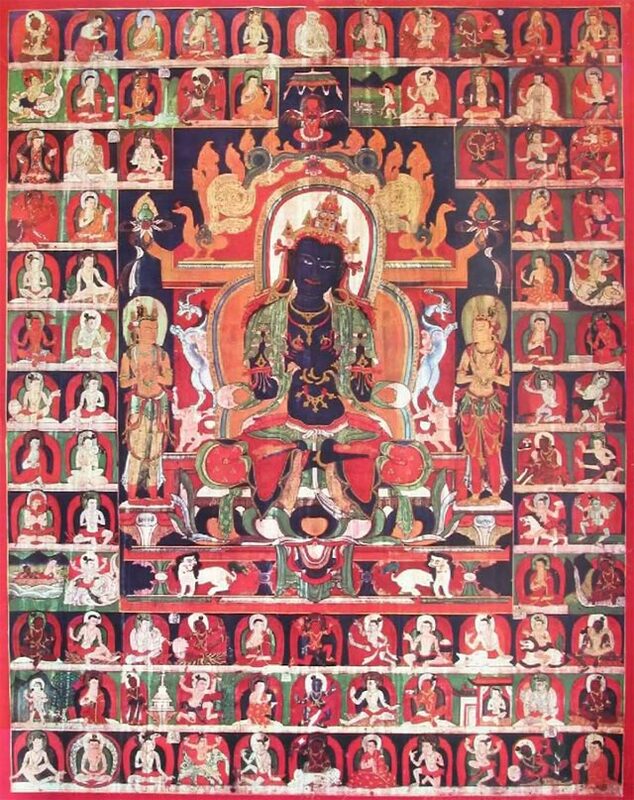 In the later Tantric Period (circa 600 – 1100), we get descriptions of 84 great masters called the Mahasiddhas (figure 6). Among them is the man credited with helping birth Hatha Yoga, Matsyendra. 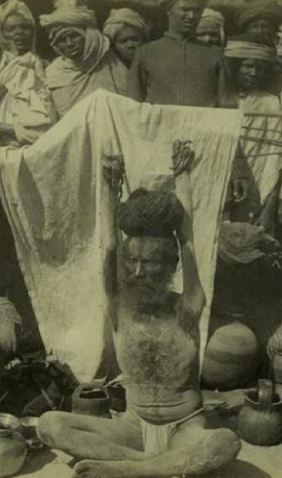 In the depiction of him below, (figure 7) he takes a pose similar to Tree. As a balancing pose, Tree Pose requires some warm-up, but not too much. 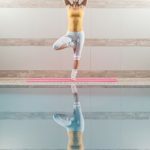 It can come early in a yoga session and is done several ways, but usually with one foot pressed firmly but sensitively on the inner upper thigh, while the standing leg keeps a hairline bend at the knee. The non-standing leg opens toward the side, in what is called outer rotation. To make the pose easier, the foot can be pressed lower — at the inner calf, ankle, or even touching at the floor. A more intense position — taken by Theos Bernard in figure 8 — is to put the foot in the opposite hip-crease while deeply creasing the bent leg. However you set it up, focus on the feeling in the standing foot as it touches the floor, but then bring the earthy energy of the floor up the body, and through the crown, and into the sky — then bring bright sky energy back down through the crown into the Earth. Use an exterior gazepoint (antar dristi) for steadiness; focus in one place on the wall or floor (or, to challenge yourself, create an unchanging interior image (bahir dristi) and hold the pose while closing your eyes!). Bernard’s pose takes the classical arm position. They form a diamond halo around the head, using penetrating energy (vigaha) through the pointing fingers and elbows. 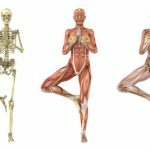 Most of today’s yogis do Vrikshasana regularly in their yoga classes, but not too many know what the hands mean in their different positions. Held at the heart, they show devotion to the guru; at the brow, to God; and over the head, to the Formless Absolute. 2 The Gheranda Samhita, 2004, James Mallinson, translator, Woodstock, NY: YogaVidya, p. 44.